In a relatively short period of time, the internet has become an influential arena for public debates about political and social issues. And around the world, many consider free expression in cyberspace to be a fundamental right. Majorities in 32 of 38 countries surveyed by Pew Research Center in 2015 believe that allowing people to use the internet without government censorship is important. And in 20 countries, at least 80% hold this view. 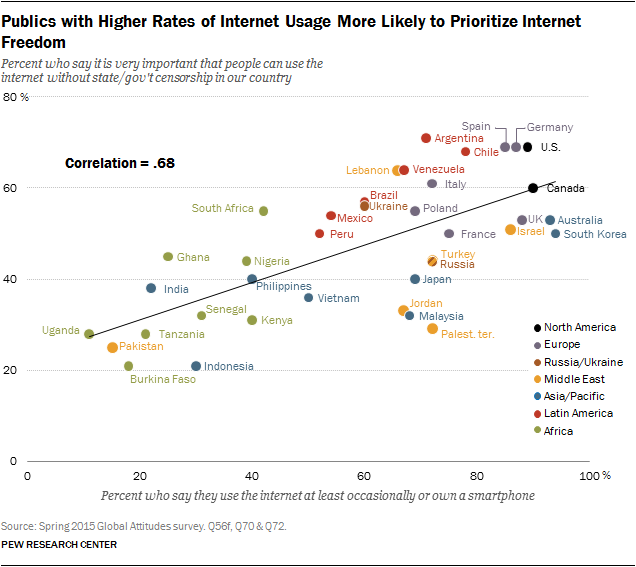 Moreover, across the nations polled, a median of 50% say freedom on the internet is very important. 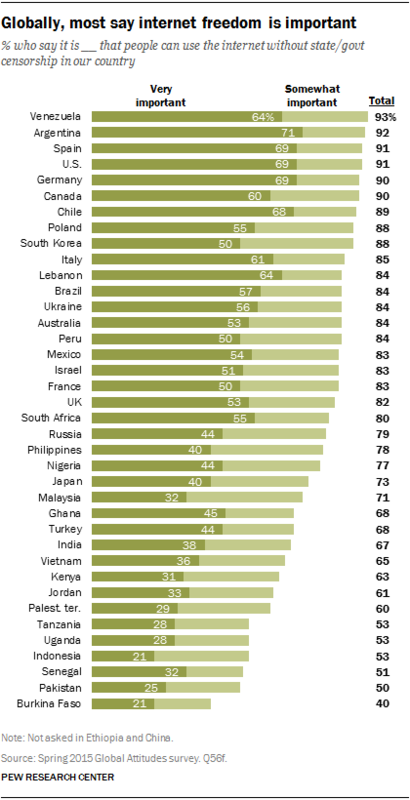 Support for internet freedom is especially strong in Argentina (71% very important), the U.S., Germany and Spain (each 69%), and Chile (68%). In many countries, young people, those with more years of education and high-income respondents tend to place a higher value on internet freedom. Even though support for internet freedom is common around the globe, it is not as strong as support for other fundamental aspects of democracy. Across the 38 countries in our study, larger percentages of people say religious freedom (median of 74%), gender equality (65%), honest and competitive elections (61%), free speech (56%) and media freedom (55%) are very important. However, the findings suggest that as access to the internet continues to spread globally, demands for freedom in cyberspace may grow as well. Countries in which a large share of the public reports using the internet also tend to have greater levels of support for internet freedom. The internet has become central to politics in part because it has been so quickly integrated into people’s lives. As a recent Pew Research Center report highlights, once people have access to the internet, most start using it on a daily basis, and most also begin to engage in social networking. And when people have access to these technologies and platforms, they use them to engage in politics. In a 2014 poll of 31 emerging and developing nations, a median of 54% of internet users said they went online to get political news, making this the second most popular online activity among the eight tested (staying in touch with family and friends was first). Moreover, the internet is regularly being used not just for consuming information about politics, but for expressing ideas about politics. This has been especially true in several Middle Eastern nations surveyed over the past few years as the region has struggled with political upheaval. For example, more than six-in-ten social network users in Lebanon, Egypt and Jordan said they use sites like Facebook and Twitter to share their political views.